April Kennedy...My Life + My Style: IS THAT TO SCRATCH IT? IS THAT TO SCRATCH IT? The first thing people ask Dave when they see his cast is ...."Is that to scratch it?" It actually makes us laugh out loud it has happened so often. In fact when we had pizza delivered the other night, the pizza delivery guy before even saying, "here's your pizza." asked "is that to scratch it?" We both laughed in awe saying, "did he really just ask that before even talking about our pizza?" People will be having a regular conversation with Dave and then see his cast with his funny port and lose their train of thought, thinking that is the best thing ever....a scratch hole! "NO....it is not to scratch it." It is a port to insert a bone stimulator machine that he has been using two times a day for 20 minutes each time, or in case he missed a day....all night while sleeping, hitting the reset button every 30 minutes after it has beeped at us for 10 minutes straight....of course he is still snoring, but it has woken me up thinking the alarm clock is going off AGAIN. ALL. NIGHT. LONG. Thank goodness that bone stimulator worked though. Dave got his cast off yesterday (2 weeks early). Good bye STENCH. He broke his wrist back in November. Remember my "thumbs up" post? 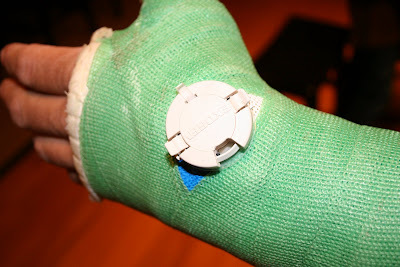 This cast was for that same injury. And if the bone stimulator didn't work, he was going to be off to surgery. We heart the bone stimulator ALARM CLOCK and are glad it worked. Just yesterday I thought about that because I was sure you were going to write about that story. Then I thought, "how nice of her to save us (me) the embarassement!" Then I remembered that I don't get embarrassed. Go for it...but you can be sure I will respond to defend myself! In the stimulator's defense...it does appear to be a neat little turn scratcher thingy-ma-bob. Can't wait to hear "Mom's" defense! So before I started reading your blog I looked at the picture and I totally was like "hmmm how interesting... so smart for them to leave little scratch sessions!"